The only power Satan has is what you give him. Jennifer LeClaire, editor of Charisma and SpiritLed Woman magazines, is known for her hard-hitting, no-nonsense approach to the enemy. With this signature passion, she exposes fourteen harassing demons and equips you to overcome them. 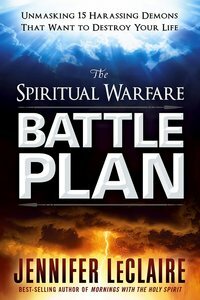 The Spiritual Warfare Battle Plan discloses who these pestering spirits are, reveals their agendas, tells how they operate against us, and provides strategies for resisting them. This book will help set captives free by shining light on darkness that many don't know exists. About "The Spiritual Warfare Battle Plan"
Jennifer LeClaire is a prophet and teacher whose passion is to equip believers to understand the will and ways of God. She carries a reforming voice that seeks to turn hearts to the Lord and edify the Body of Christ. She is also the editor of The Voice magazine. Visit Jennifer's website at www.nextlevelprophetic.com.